This mural evokes memories of a bygone time; the days of schoolhouses, where teachers taught children of all ages in one room. It portrays a lesson out in the meadow, under the trees. It was originally painted for Marg and Al Johnson, long time business owners and Chemainiacs, for one of their businesses, Small Tall Treats. 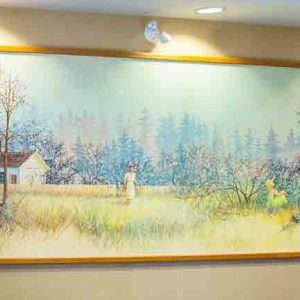 Their daughters subsequently gave the painting to the Chemainus Festival of Murals Society. It is now permanently installed at the Best Western PLUS Chemainus Inn.